April Kennedy...My Life + My Style: I Lied + I'm in Love. I Lied + I'm in Love. Sorry for poor picture quality. The sun isn't up yet. but I pulled an all-nighter sewing. Queen Bee Market is tomorrow and I didn't get any pictures uploaded. Seriously never went to sleep. I tend to do that from time to time. I'll catch 4 hours or so on the road. Blake will keep Dave company. He's a chatter box in the car! But back to QBM and my sewing. It's official....I'm in love with a few new aprons and one pillow in particular that will be making their debut down south. I'll share pictures once I get set up tomorrow. If you are in the Del Mar area, I'd love to see you! Oooh, I have that tea towel from anthro. I love it as an apron! That is adorable!! I can't wait to see you on Saturday. Good luck at the market, April! Have fun and take lots of pictures for us. yay! can't wait to see the new products. good luck at QBM, wish i lived anywhere near that area so i could go. Oh my goodness! I'm heading to the QBM tomorrow and I can't wait to see what you've been working on. I am in love too! I wish I could go to the market! 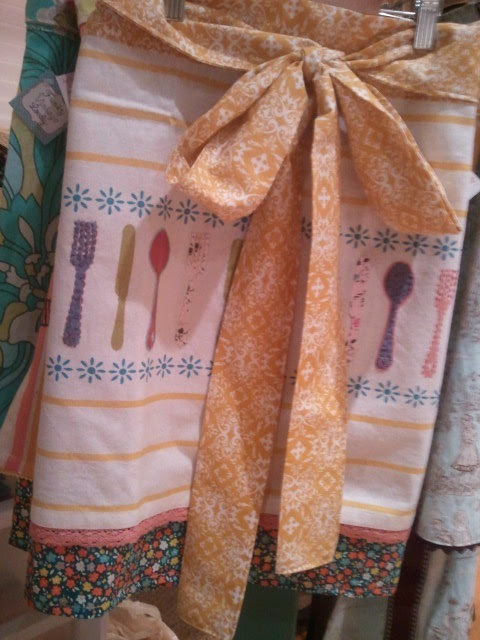 Living in Utah doesn't help me get there:) I am hoping to see some of those darling aprons in your shop. Good luck and I think I will plan a trip with my sisters for the next Queen Bee Market!